The following essay was the winner of the Manitoba Historical Society’s 1999 Edward C. Shaw “Young Historians” Award. Gray and empty, the old thermal power plant stands behind the Centennial Concert Hall. Each day hundreds of people drive past it, never even taking a second glance. It has been years since it operated, and today it stands waiting as the city decides what will happen with the land. However, beneath this desolate building, there was once a park which eighty-one years ago became the meeting place of thousands of workers fighting for their rights during The Winnipeg General Strike of 1919. Although today the park has been destroyed, sacrificed in the desire for more building space, it is important to remember what it was and what it stood for. This park was Victoria Park, and during the six weeks of the General Strike, it became a place where the striking workers and their supporters could speak and be heard. Victoria Park had been part of Winnipeg since 1900, when it had been named in honour of Queen Victoria. Located at the end of James Street, near the Old Labour Temple and two blocks from City Hall, the park was carefully tended, and a popular place, particularly in summer. One day after the Winnipeg General Strike began officially at 11:00 A.M. on 15 May 1919, on the morning of 16 May, this peaceful park was filled with thousands of workers, all listening as Reverend William Ivens spoke. William Ivens was a socialist, who had been a minister until he was expelled from the ministry because he would not accept the authority of the Church. He was a member of the Central Strike Committee, had founded the Labour Church and was also the editor of the Daily Strike Bulletin. In his first speech at the park, Reverend Ivens urged the workers riot to give up their fight, saying “If you will but stand firm for a short time, we will bring them cringing on their knees to you saying: ‘What shall we do to be saved?’”  He would repeat this message several times during the strike. In the six weeks of the Strike, every Sunday, Ivens would hold services of his Labour Church at the park. In these services news of the strike was relayed and prayers were said. Sounds of the workers singing the Labour Hymn could often be heard in Victoria Park: “When wilt thou save the people, Lord; O god of mercy, when? ; The people, Lord, the people; Not crowns and thrones, but men.”  This was the prayer of the thousands of families who gathered in the park to listen and to hope for their victory. 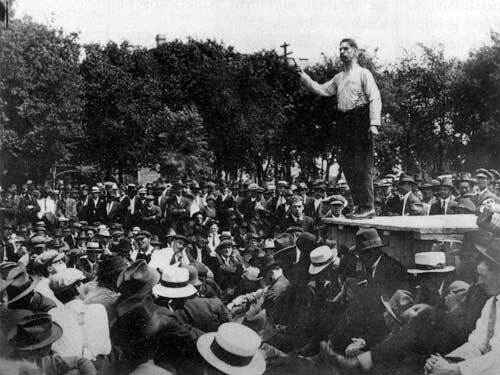 Roger E. Bray speaks to a crowd of strikers at Victoria Park, 13 June 1919. The people who started the General Strike, were the workers of the Metal Trades Council. The employers had refused to bargain with the Union, and the metal trades workers felt this was unfair. They were also being denied their basic rights, such as a fair wage. They went on strike and asked other workers in other industries to strike with them out of sympathy. On 6 May, the Winnipeg Trades and Labour Council, which represented the labour unions, took a vote to see whether or not they would support the workers and join the strike. Over eleven thousand voted to join the strike, and only five hundred had voted against. The Council set the beginning of the strike for 11 A.M. on Thursday, 15 May. The first workers to leave their jobs were the telephone workers. They left work at 7:00 A.M., and were not replaced, but most of the workers stopped at 11:00 A.M., the time that had been set. The buses stopped running, the post office shut down, restaurants were abandoned by their employees, even elevators stopped. Between 25,000 and 30,000 workers in both the public and private sectors walked off their jobs. Winnipeg was without things such as mail, taxis newspapers, telegrams, telephones, janitor service, or barbers. At the beginning of the strike there was also no gasoline, milk or bread, and very little meat. The waterworks employees remained at work, with permission of the Strike Committee, but the water pressure was reduced, so as to provide only for basic necessities. The City stopped. Because of the large number of workers participating in the strike, it was very hard to get information to all of them. The strike board produced their own newspaper, “The Daily Strike Bulletin,” however it was necessary for all the workers to meet. Victoria Park provided an ideal space for this, because of its space and location. Because it was located so close to downtown, it also provided a good point from which marches and parades could begin. Daily mass was held at the park, but it was not only to pray, but for the workers to join together in solidarity. The workers were told to keep off the streets; but it was warm and any excuse to get out of their homes was welcome. The meetings at Victoria Park, offered a good opportunity to do this. The meetings were open, and often instead of sermons, people heard discussions on what the workers deserved, and how long the strike could last. The speaking stages were make-shift, often little more than a wooden platform. People would speak from the back of pickup trucks, or from among the crowd. People would dress in good clothes, and entire families would come to the park. As the labourers listened to their leaders, children would enjoy the chance to play outside. These meetings were not only a social occasion; they were tremendously important both morally and organisationally. On Sunday evening, 25 May a Labour Church meeting was held at the park. There were over 7,000 workers there, and they were angry. The government had issued an ultimatum; if the workers did not go back to work by 10:00 A.M. on May 26, they would be discharged, losing the rights to pension and forfeiting any rights of employment. The workers were also told that they would have to sign an agreement saying that they would never again take part in a sympathetic strike, and that they would sever all connections with the Winnipeg Trades and Labour Council. On the morning of 26 May, after the meeting in the park which had lasted for most of the night, of the 7000 employees present at the meeting, only 16 postal workers went back to work. It was this type of meeting at the park, which made the strikers informed and united, allowing the strike to continue despite threats and fear. Victoria Park was also the place where the workers parades often began and ended. Because it was located only two blocks from City Hall, it was a perfect place in which to organise and rally. It was not really until 31 May, that the public demonstrations began. Soldiers returning home from the war had arrived to a state of social unrest, they saw the workers and government fighting and felt not enough was being done. Thousands of these former soldiers, along with many civilians, confronted Premier Norris on Friday, 31 May, demanding collective bargaining, so that the strike could come to a peaceful end. Around 2,000 managed to enter the Legislative Building, while about 10,000 more stood outside. Premier Norris however, felt that he could not take action, and instead advised the soldiers to remain calm and collected. The soldiers then marched to City Hall, to meet with Mayor Gray. He gave the soldiers similar advice, keep out of the fight and stay calm. Still not satisfied, the soldiers gathered in Victoria Park, having overturned a Coca-Cola wagon on the way. Here they discussed the events of the day, and what they felt should be done. This was just the first of many demonstrations that would congregate in Victoria Park, before or after their exhibitions. In fact, just two days later on Monday, 2 June, another parade formed, starting in Victoria Park. This time they proceeded along Portage Avenue to the Legislative Building and once again they met with Premier Norris, but with the same unsatisfactory result as previously. 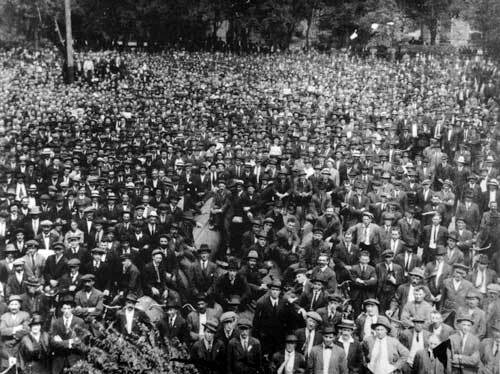 Crowd in Victoria Park during the General Strike, 1919. On 3 June, a parade formed again in Market Square, just behind the City Hall, but soon returned to nearby Victoria Park, where Roger E. Bray, a socialist who had become the spokesman for the returned soldiers, announced that the soldiers had met with the Premier also with unsatisfactory results. The parades became more and more outspoken, at times bordering on violent expression. On 5 June, Mayor Gray had become increasingly alarmed at the possibility of trouble, issued the first proclamation forbidding parades, saying; “In virtue of the authority vested in me, I do hereby order that all persons do refrain from taking part in any parades.”  The proclamation had stopped the parades temporarily, and on 7 June, the Mayor addressed a large meeting in Victoria Park. Although the parades may have instilled confidence, they had also gone against the strike committee’s policy of inaction, and throughout the rest of the strike, order was never really re-established, and there were increasing signs of an approaching crisis. Tension was rising on both sides, and the public was becoming irritated with what seemed like a long, drawn out battle. On 10 June, people began to grow violent. A crowd formed around the corner of Portage and Main and started to jeer at and push two people who had been on guard at the intersection. Many other temporary soldiers, recruited to keep order during the strike came to control the mob, however, the crowd retaliated with sticks and stones. Some of the soldiers suffered broken bones. Mayor Gray tried to reason with the crowd, but the anger felt during the strike was mounting. At the same time, a large parade was being formed in Victoria Park, presumably with the intention of moving to Portage and Main. Mayor Gray managed to locate the leaders of this parade, and told them, under the threat of force, to cancel the parade. The parade was canceled, but the crowd on Main Street did not disperse until after 6 o’clock in the evening. An article in the Free Press the next day called the actions of the protesters “murderous assaults by riotous aliens,”  and the Tribune called the protesters “enemy ruffians.”  These reports are said to have destroyed any remaining chance for success, but the strikers did not give up hope yet. Thursday, 12 June was ‘Ladies Day’ at the Soldiers Parliament in Victoria Park. Women strikers, and the families of strikers sat in the seats near to the central platform, while the male strikers stood at the rear. Several prominent strikers spoke, including Roger Bray, F. J. Dixon, and J. S. Woodsworth, who was later to become the founder of the Cooperative Commonwealth Federation, the precursor to the NDP. Later that evening a Labour Church meeting was held in the park. A band opened the services, and familiar hymns were sung. This was to be the last truly peaceful meeting at the park. Shortly after midnight on the morning of 17 June, a frantic woman phoned the Chief of Police, Chris Newton. The North-West Mounted Police had permission to arrest her husband, George Armstrong, who was one of the leaders of the strike. The police chief said he could do nothing, there was a warrant. The plan to arrest the strike leaders had been created mainly by two men, Senator Gideon Robertson, the Federal Minister of Labour and A. J. Andrews, a prominent Winnipeg lawyer and head of the Committee of One Thousand, an anti-strike group of many business people and professionals. Warrants were issued so that all leaders of the strike could be arrested and confined. George Armstrong was one of these leaders. He was taken to Stony Mountain Penitentiary that June morning. William Ivens and R. B. Russell were two of the other strike leaders arrested. For the strike leaders, and for most of Winnipeg, these arrests came as a surprise. Later that morning a meeting was held at Victoria Park, which was filled with emotion and anger, but the strike had lost its leaders, and was losing its strength. Sympathy strikes were being held in many parts of Canada, but the arrests of the strike leaders meant that these strikes would not continue for long. Those who were anti-strike knew the impact this would have. On 19 June, Prime Minister Robert Borden sent a message to Senator Robertson saying “warmest congratulations upon your masterly handling of a very difficult and complicated situation.”  Bail was granted to the leaders on 20 June, but only on the condition that they would take no further part in the strike. By this time, most of the strikers had agreed to go back to work, but there was to be one final battle. This came mainly not from the Strike Committee, who feared further arrests, but from the soldiers. The soldiers met in Market Square on the evening of 20 June, and decided to have a silent parade the next day. On Saturday, 21 June, this parade, which became the final riot was held. This day has become known as “Bloody Saturday.” Mayor Gray had renewed the ban on Parades, saying that the civic authorities have “absolutely committed themselves to the breaking up of any demonstrations.” He also warned that “any women taking part in a parade do so at their own risk.” Even these threats were not enough to stop the final parade from taking place. Early that Saturday morning many of the leaders of the strike including William Ivens, Robert Russell, John Queen, A. A. Heaps, George Armstrong, and Roger Bray were released on bail. A final meeting between the leaders of both sides failed to produce a cancellation of the demonstration, which was set to begin at 2:30 that afternoon. Crowds began to form along Main Street between City Hall and Portage Avenue. Mayor Gray requested emergency assistance from the Mounted Police. The crowds of strikers and supporters collided with the group of North-West Mounted Police, Bloody Saturday had begun. Crowd at Victoria Park during the General Strike, 1919. The mounted officers rode into the crowd on Main Street, swinging baseball bats. Mayor Gray read the Riot Act on the steps of City Hall, but the riot continued. At this point the police drew their guns and fired into the crowd. It is still unknown whether the strikers or the police fired first, but it is known that two civilians died. Mike Sokolowiski, who was a tinsmith, died instantly, and Steve Schezerbanowes would die later as a result of gangrene from gunshot wounds. The fighting continued, and became most violent in a place called “Hell’s Alley,” which ran between Market Avenue and James Avenue. Here twenty-seven people were injured. Before the riot was over, there had been ninety-four arrests, and hundreds of minor injuries. The workers were unable to fight the government any more, and the Winnipeg General Strike came to an end. The next day a meeting was held in Victoria Park, but this one was filled not with prayers for success, but mourning for the dead and for the loss of the strike. 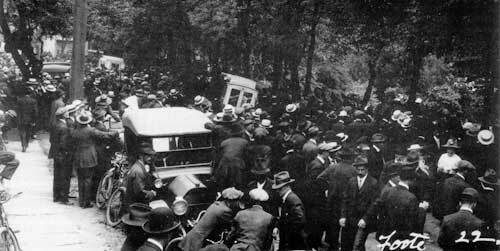 Meetings were still held in the park, but they had lost their force, now they were just meetings to discuss the imminent end to the strike. On June 24 the Western Labour News which had done so much to rally and guide the strike was banned. On the same day, the authorities heard that another parade was being formed in Victoria Park, and the park was closed. Mayor Gray and the soldiers stood by, watching the 400 people present in the park at that time file out. Two days later, on 26 June, at 11:00 A.M., the strike was officially called off. The metal workers returned to work, without a pay increase, while the telephone workers had to reapply for their jobs. These telephone workers were denied seniority protection, and were only rehired after pledging that they would never again take part in a sympathetic strike. In the end, 119 telephone workers, 403 postal employees and 53 firemen were denied a return to work. The efforts of the workers had not succeeded, at least at that time. Despite the seeming failure of the strike, it has managed to change the working conditions in Winnipeg. Since 1919 many issues have been discussed and fought over, with different results, but workers have found power and strength. The courage that the workers displayed during the Winnipeg General Strike is something that will not be forgotten, because the workers finally fought the unfair treatment to which so many people, both in Winnipeg and around the world are subject to. Some see the strike as a riot filled with disorder, but others see it as a call for independence, equality and fairness. Whichever way we choose to see the strike, we cannot deny that it played a huge role in the history of Winnipeg, as did Victoria Park. Now, 81 years later a thermal plant covers the land where the workers stood, and it is time to question whether, as we built over and forgot Victoria Park, did we also forget what the workers had fought for? The effects of the strike can still be felt today, but very rarely is proper tribute paid to those who effected these changes. We have entered a new millennium, and it is a time for growth and change, but it is also a time to remember what so many of our parents and grandparents struggled for. The land that was once Victoria Park is now to be transformed again, but today its fate remains undecided, it is in the hands of the highest bidder. Perhaps the land will become the site for an apartment block, or office towers, or maybe one day another park will stand in its place, including a museum of Labour History in Manitoba. A park such as this would not only be a place where a new generation could voice their opinions and ideals, but also a tribute to the people who have changed and molded the history of Manitoba and all of Canada risking all they had worked for to do so. 1. Preliminary Hearing: The King vs. William Ivens et al., testimony of William E. Davies. 3. Excerpt from the Riot Act. 4. Manitoba Free Press, June 11, 1919. 5. Western Labour News, June 11, 1919. 6. Robert Borden, Ibid., June 19, 1919. Bumsted, J. M., The Winnipeg General Strike of 1919. An Illustrated History, Winnipeg Watson and Dwyer Publishing, 1994. Masters, D. C., The Winnipeg General Strike, Toronto: University of Toronto Press, 1950. The 1997 Canadian Encyclopedia Plus, CD ROM, Toronto: McClelland and Stewart, 1997. Archives and Special Collections, University of Manitoba.